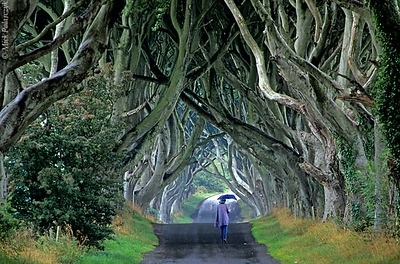 [BRITAIN.IRELANDNOR 21.865] ‘Beech cathedral.’	At Stranocum, east of Coleraine, the mysticism of Ireland is embodied by this splendid tunnel of beech branches wich arch up like the vaults of a gothic cathedral. Photo Mick Palarczyk. 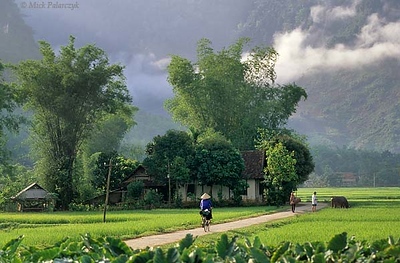 [VIETNAM.NORTH 21.268] ’Lac Village.’	Morning mist dissolves when sunrays reach Lac Village which lies surrounded by rice fields on the bottom of the deep valley of Mai Châu. Photo Mick Palarczyk. [BURMA 24.760] ’Acacias.’	In the Sittaung Valley north of Lewe an ox drawn hay-wagon lumbers on a road lined with ancient acacias. Photo Mick Palarczyk. [BURMA 24.786] 'Tree at Pindaya.' 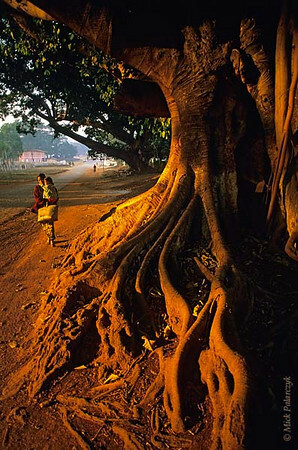 The gnarled roots of an ancient tree catch the first sunlight at Pindaya, in the highlands north of Kalaw. Photo Mick Palarczyk. 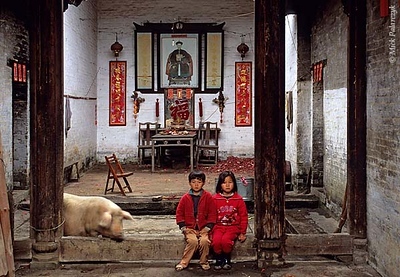 [CHINA.GUANGDONG 25.194] ’Temple playground.’	Children and animals have free acces to this temple in Gaofeng, a village near Huaji. On the temple wall an imperial official exhorts the villagers to be proud of their country and make it strong. Photo Mick Palarczyk. 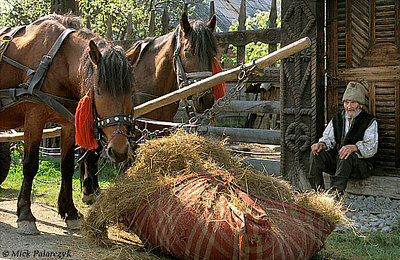 [ROMANIA.MARAMURES 23.729] ’Thread of Live.’	While his horses are feeding this old farmer at Mara village is resting against a yard gate that has been decorated with heathen symbols such as the Thread of Live. Photo Mick Palarczyk. 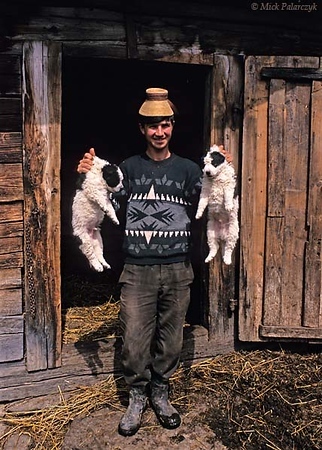 [ROMANIA.MARAMURES 23.669] ’Puppies.’	Wearing a ‘clop’, the traditional headdress of the Maramures, this farmer’s son proudly shows his puppies at the village of Sîrbi. Photo Mick Palarczyk. 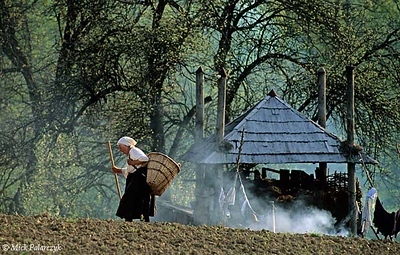 [ROMANIA.MARAMURES 23.827] ’Returning home.’	After a day’s work in the field a farmer’s wife returns home to her house in Hoteni. Photo Mick Palarczyk. 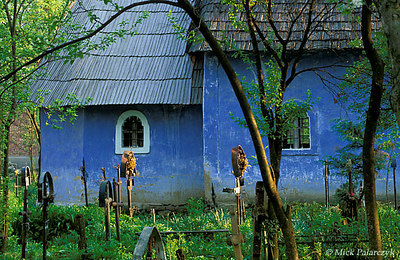 [ROMANIA.MARAMURES 23.675] ’Colourful church.’	The church of Strîmtura shimmers as a blue pearl behind the green foliage of its churchyard. Photo Mick Palarczyk. 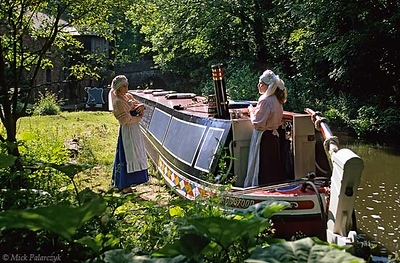 [BRITAIN.ENGMIDDLE 22.051 ’Froghall Wharf.’ Froghall Wharf is the base for narrow boats which navigate the Caldon Canal with a staff dressed in typical 19th century boatwomen’s clothes. Photo Mick Palarczyk. 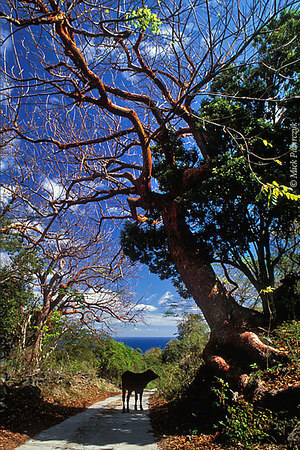 [ANTILLES.stEUSTATIUS 25.610] ’Tourist Trees.’	The reddish branches of Turpentine trees (Bursera simaruba) arch over a small country road east of the Quill, St.Eustatius’ dormant volcano. Photo Mick Palarczyk. [RUSSIA.GOLDENRING 25.991] 'Alexandrovski Convent.' 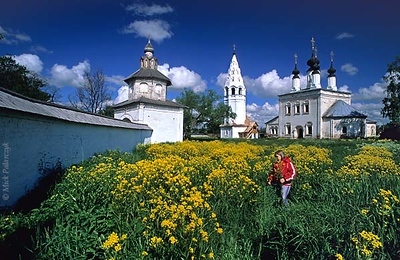 In the grounds of Suzdal's Alexandrovski Convent a girl is picking cole-seed flowers. The Ascension Church and the bell-tower were built in the 17th century. The surrounding wall and leaning Holy Gate on the left date from the 18th century. Photo Mick Palarczyk. [RUSSIA.GOLDENRING 25.940] 'Monastic wall.' On the bank of the Kamenka River Suzdal's Spaso-Yevfimiev Monastery is protected by 17th century walls. Above it rises the big square southern entrance tower. The monastery houses several museums of religious art. Photo Mick Palarczyk. [YEMEN.NORTH 26311] 'Kahel village.' 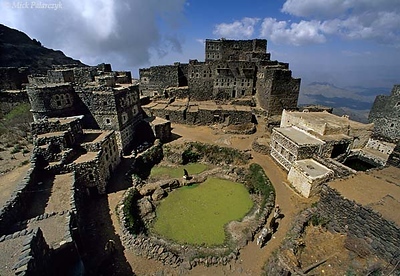 The tower houses of Kahel village sit on a craggy rock pedestal in the Jebel Haras mountains south of Manakha. Photo Mick Palarczyk. [TURKEY.CENTRAL 26923 'Village under the volcano.' Spring snow still covers the slopes of the Hasan Dag volcano, looming behind the Cappadocian village of Ihlara. The Hasan Dag is one of the volcanos that were responsible for covering the region with ash, resulting in the spectacular tuff formations for which Cappadocia is famous. Photo Mick Palarczyk. 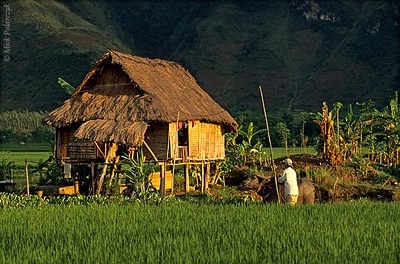 [VIETNAM.NORTH 21.263] ’Stilted house.’	A family of the White Thái mountain tribe lives in this stilted house at Lac Village near Mai Châu. Photo Mick Palarczyk. 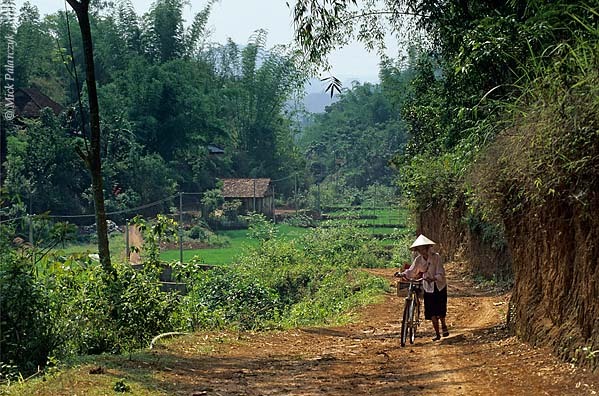 [VIETNAM.NORTH 21.317] ’Valley near So’n La.’	Valley with rice fields southwest of So’n La. Photo Mick Palarczyk. 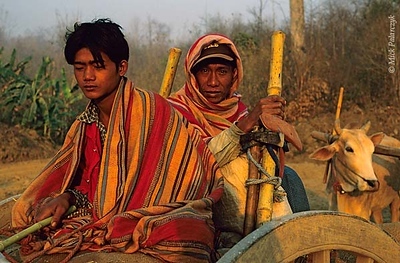 [BURMA 24.768] ’Farmers on ox-cart.’	In the early morning light farmers are heading for their fields on an ox-cart in the highlands west of Kalaw. Photo Mick Palarczyk. 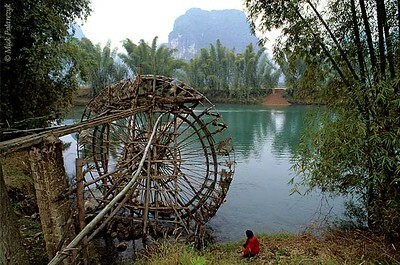 [CHINA.GUANGXI 25.401] ’Irrigation wheel.’	A water-powered irrigation wheel south of Yangshuo is used to lift water from the Yulong River to nearby rice fields. Photo Mick Palarczyk. [ROMANIA.MARAMURES 23.896] ’Valeni.’	On the verandah of a traditional wooden house in Valeni shirts are drying in the sun. Photo Mick Palarczyk. 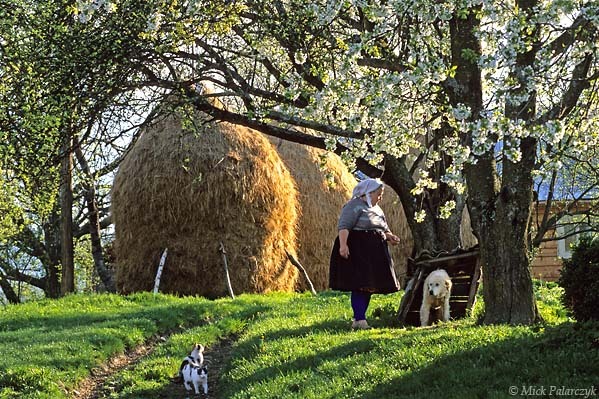 [ROMANIA.MARAMURES 23.636] ’Repentant dog.’	After having been bullied by the watch-dog, kittens are satisfied onlookers as the remorseful culprit is punished by this farmer’s wife in Breb, a small village south of Sighetu Marmatiei. Photo Mick Palarczyk. 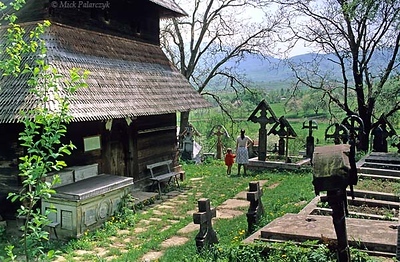 [ROMANIA.MARAMURES 23.692] ’Church with a view.’	At the medieval wooden ‘Church on the Hill’ in Ieud, there is a wide view across the valley of the Iza. Photo Mick Palarczyk. [ROMANIA.MARAMURES 23.648] ’Shepherd near Breb.’	While keeping an eye on her sheep this shepherd has attached her braiding work to a fence. Photo Mick Palarczyk. 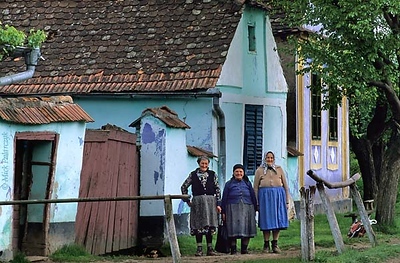 [ROMANIA.TRANSYLVA 24.168] ’Old friends.’	Ioan Comsa and her friends belong to the last inhabitants of Zlagna, a village south of Biertan and one of many that are depopulating rapidly in this region. Photo Mick Palarczyk. [BRITAIN.ENGMIDDLE 22.171] ’Playing cards in icebreaker.’	Students in 19th century dress play a game of cards in an old wooden icebreaker, once used to keep open the canals in winter and now on display on the bank of the Shropshire Canal in Blists Hill Museum at Ironbridge. Photo Mick Palarczyk. [RUSSIA.GOLDENRING 26.021] 'Exchanging gossip.' 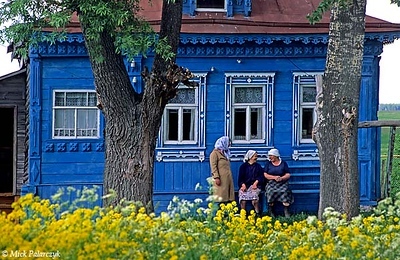 Neighbours are exchanging gossip in front of an izba (traditional wooden house) in Ves village, north of Suzdal. Photo Mick Palarczyk. [RUSSIA.GOLDENRING 26.011] 'Corn mills.' 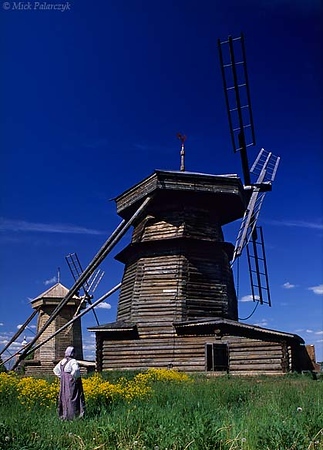 Suzdal's Museum of Wooden Architecture boasts two 19th century corn mills from Drachevo village. Photo Mick Palarczyk. [YEMEN.NORTH 26302] 'Al Jebel.' The tower houses and white mosque of Al Jebel village are centered around a water cistern. The village lies in the Jebel Haras mountains south of Manakha. Photo Mick Palarczyk. [FRANCE.ALPSSOUTH 24.380] 'Sunflowers in Drôme valley.' 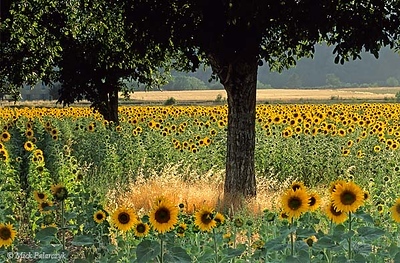 Near Molires-Glandaz, south of Die, the Drôme valley colours yellow with fields of sunflowers. Photo Mick Palarczyk.